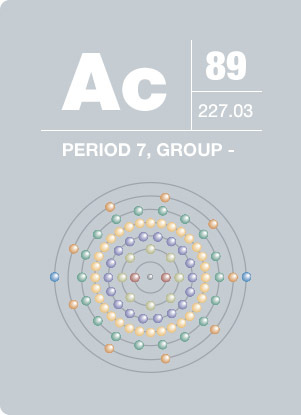 Actinium is a silvery, metallic element. Actinium gets its name from the Greek word aktinos, meaning beam or ray. Due to its intense radioactivity, actinium glows in the dark with a pale blue light. 150 times as radioactive as radium, actinium presents severe health effects if ingested in even the slightest amount. Actinium is used to produce bismuth for medical applications or can be used on its own as an agent for radio-immunotherapy.